Objective of the study: To analyze short term results of a new technique i.e. 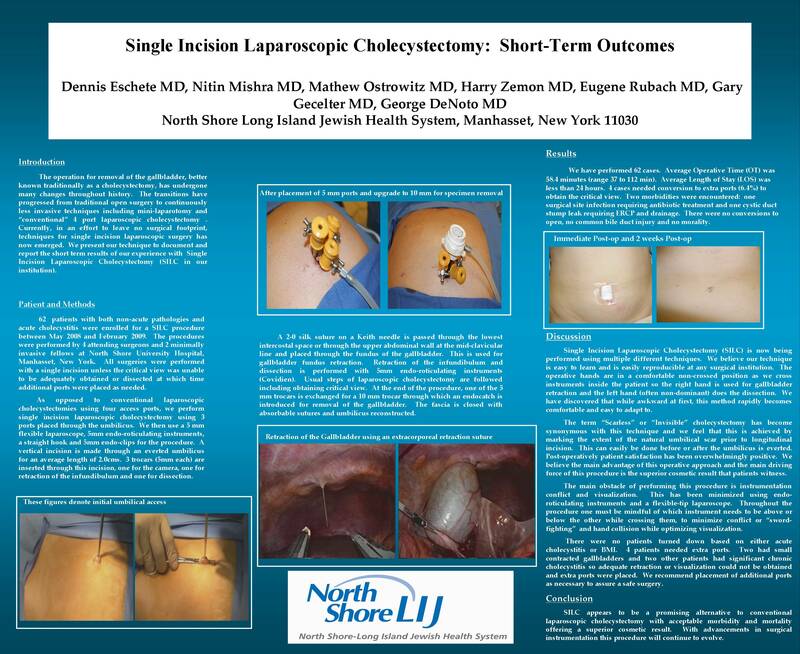 Single Incision Laparoscopic Cholecystectomy. Methods: As opposed to conventional laparoscopic cholecystectomies using four access ports, we perform the Single Incision Laparoscopic Cholecystectomy (procedure termed SILC) using a 5 mm flexible laparoscope, endo-roticulating instruments and 5 mm endo-clips. A vertical incision is made at an everted umbilicus for an average length of 2.5cm. 3 trocars (5mm each) are inserted through this incision for the dissection. A 2-0 silk suture on a Keith needle is passed at the upper border of the 11th rib at the mid-clavicular line and placed through the fundus of the gallbladder. This is used for gallbladder retraction. Dissection is performed with endo-roticulating instruments. Usual steps of laparoscopic cholecystectomy are followed including obtaining critical view. At the end of the procedure, one of the 5mm trocars is exchanged for a 10mm trocar through which an endocatch is introduced for removal of the gallbladder. The fascia is closed with absorbable sutures and umbilicus is reconstructed. Results: We have performed 28 cases. Average operative time was 64.5 min (range 37 to 90 min). Average length of stay was less than 24 hrs. 2 cases needed conversion to 3 ports (7.1%) to obtain critical view. Two morbidities were encountered: one surgical site infection requiring antibiotic treatment and one cystic duct stump leak requiring ERCP and drainage. There were no conversions to open, no CBD injury, and no mortality. Conclusion: SILC appears to be a promising alternative to conventional laparoscopic cholecystectomy with acceptable morbidity and mortality. With advancements in surgical instrumentation this procedure will continue to evolve.